The site has since played host to a variety of residencies, allowing space for artists to work outside their usual comfort zones. For one week in August 2014, a project called Remote Performances was set up by London Fieldworks in which the Outlandia site was transformed into a temporary radio station, allowing 20 artists, poets, writers, musicians and the local community space to reflect on their unique surroundings. This installation at Edinburgh College of Art features sound recordings from the Remote Performances 2014 project, peppered with other installations and video works relating to Outlandia. While the Remote Performances project and the site are both fascinating, it is questionable whether this light, clinical space filled with computer screens really captures the dirty, rugged nature of the site at Glen Nevis, but two projects in this space come close. One is a video created by London Fieldworks titled Outlandia Boardwalk, which films the long wooden walkway leading to Outlandia, crossing the boggy terrain often frequented by hill-walking tourists. 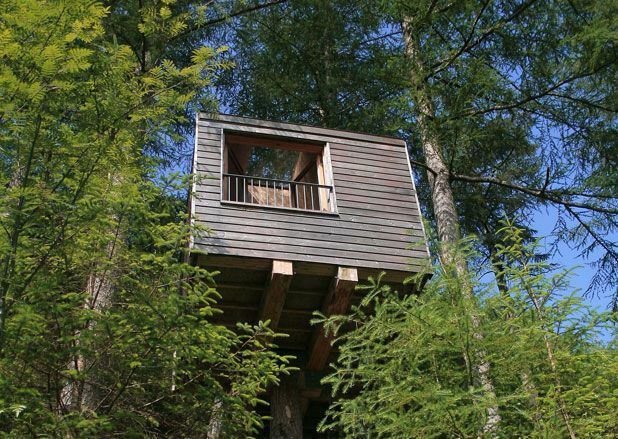 Similarly, artist Clair Chinnery’s raw installation Generic Hybrid Highland Nest is set inside a mock version of the Glen Nevis treehouse itself, including a short boardwalk leading to its entrance. Inside is a giant, grubby bird’s nest large enough for a whole person to sleep in. When accompanied by subtle sound recordings featuring shuffling and trampling noises alongside other quiet sounds, you can begin to imagine the contemplative solitude of the space. Edinburgh College of Art: Tent Gallery, Evolution House, 651 5800, until 30 Aug, free. Work by 20 artists, poets and musicians, members of the Outlandia community.